I decided to try printing out a few parts and doing some test fitting to figure out some engineering details before I order machine shop metal cutting. One of the things I wanted to print was some 1" T-slot extrusion (about 6" long). I was kind of worried that it wouldn't be precise enough to test fit other components. I needn't have worried. The embedded image seems to be a different size every time I load it. In case you can't see, my digital micrometer measures the size of this T-slot, which is 1 inch wide in the CAD file, as 1.0000 inches! If I measure it all up and down the length it might be a mil or two off but that's awesome precision. Material is ABS, printed at 240C nozzle temp and 110C bed temp in enclosure. Last edited by econopotamus on Wed May 17, 2017 6:03 am, edited 1 time in total. I saw this on reddit (r/functionalprint) yesterday and... wondered what printer it came off. As a fellow ABS printing enclosed M2 owner, cool to see! did you scale up your model slightly to account for plastic shrinkage? Farr0wn3d wrote: did you scale up your model slightly to account for plastic shrinkage? No, I did not. 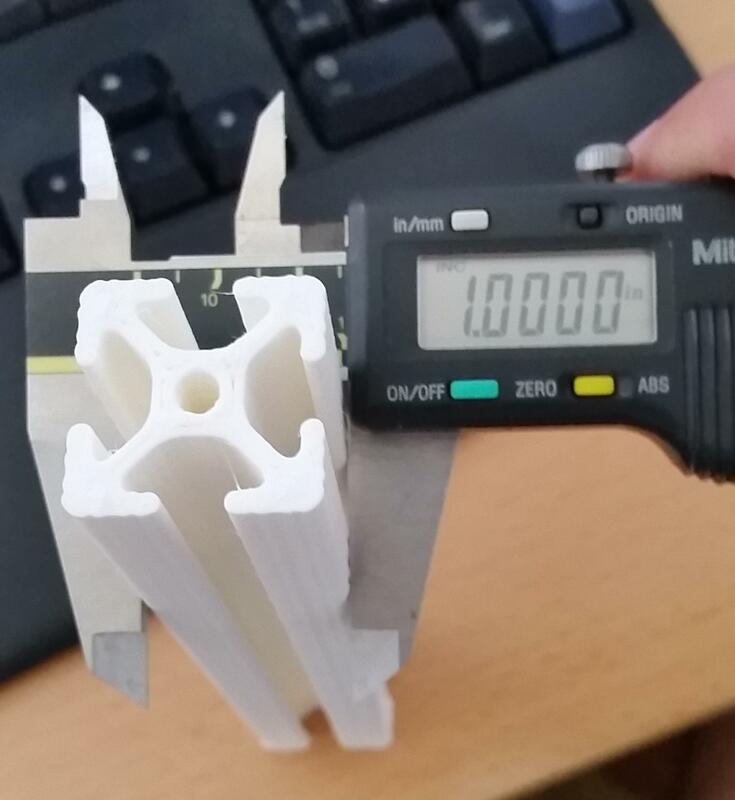 I did a temperature tower though (also posted on r/functionalprint a bit before) and picked settings where the resulting section was just the right size. There are so many parameters that impact the final size in little ways that just seems easier than trying to figure out exactly what scale up to use. I also altered the model slightly to give little cutouts in places I know FDM can result in bulge, basically optimized the path the nozzle would follow a bit.